Amazon Kindle Fire HD 6 Kids Edition Review – Is it the best budget Kids Tablet for 2014? Amazon’s Kindle Fire is steadily expanding their product line to reach a number of different audiences, and the Fire HD Kids Edition Review proves that they are not excluding any age demographic. For those parents that are considering handing down their old Amazon tablet to their child, you may want to rethink that option. The Fire HD 6 Kids Edition is a modified version of the 2013 model of the Kindle Fire HD — with the modifications being specific to the needs of children. The kid-proof case that provides an exceptional level of durability, comes in Blue, Pink, and Green, and best of all, your kids will love it. A 2-year worry-free guarantee; if it gets broken within the first two years, Amazon will replace it for free. The patented Gorilla glass display, which has survived rigorous testing and contributes to the Fire HD Kids Edition’s unsurpassed reliability. Easy to use parental controls allow parents to limit their children’s screen time and restrict usage of the device, protecting children from visiting sites that may be harmful to them. Another child-friendly aspect of this new tablet is that it comes with one complete year of FreeTime Unlimited, which includes a hand picked inventory of children’s books, apps, games and videos, meaning you can depend on a substantial amount of entertaining and educational programming for your child. In addition, your little ones will have access to channels such as Disney, PBS and Nickelodeon, as well as FreeTime Unlimited, an all-in-one comprehensive subscription that provides ideal programming for children from ages three to 10. Check out $30 off Special Discount Today! Parents are often concerned with the complexity of a device. It must be user-friendly and allow children to navigate without difficulty. The Amazon Sangria OS is an operating system with a clean and intuitive user interface, making it easy for young children to navigate and control. With this operating system, children will spend less time recruiting the help of their parents and more time enjoying the many features that are designed specifically for them. This particular feature is priceless. With so much available on the internet, there are simply things that a parent does not want their child exposed to. The Fire HD 6 Kids has parental controls that allow you to set and limit the activity on the device, setting the controls to your particular specifications. When you consider the real threat of child predators that is becoming more prevalent on the internet, having the capacity to restrict the access your children will have to certain sites that might be considered high risk is a valuable option. Unlike some of the other tablets that are on the market, the HD does not have expandable storage, which limits your ability to save videos, music and other files. The device has unlimited access to the vast selection of programs, videos and games that Amazon has to offer, and with unlimited Cloud access, the limited storage is not really a problem. The only issue is that the user cannot access programming stored on the Cloud with an internet connection. Like all other Fire tablet models, the Fire HD does not have access to third-party applications, such as the ones that can be found at the Google Play store. Although this might be considered a considerable impediment for most adults who are looking for greater flexibility, the easy access to kid-friendly apps through FreeTime Unlimitedreally makes this a non-issue. With a fully functional Amazon FreeTime camera and the additional photo software, your children will be able to explore their more creative side. They will have access to certain editing tools that will allow them to add stickers to photos as well as add drawings and print out the pictures and art that your children create to hang. You will also have the option to share the pictures with friends and family. Easy to navigate operational system. Find out why your kids should love it. Depending on what you are expecting, the $149.00 $119 (TODAY only) price tag for the 6-inch version may seem somewhat high; however, the functionality and durability of this device provides the value that justifies the cost when it is compared to the more toy-like tablets that can be found at many toy stores. It is important to remember that the HD 6 Kids Ed. is a completely functional tablet, not a toy. Fire HD 6 is only $69 today. Don’t miss it. Buy one for your kids before heading back to school. Even when some of the limitations are considered, such as the restriction of third-party apps, the Fire HD 6 Kids Edition is an exceptional device for young children. The FreeTime Unlimited programming opens up an entire new world for your children to explore. The price is much less than the leading competitor, and the device comes well equipped to meet your children’s entertainment and educational needs. 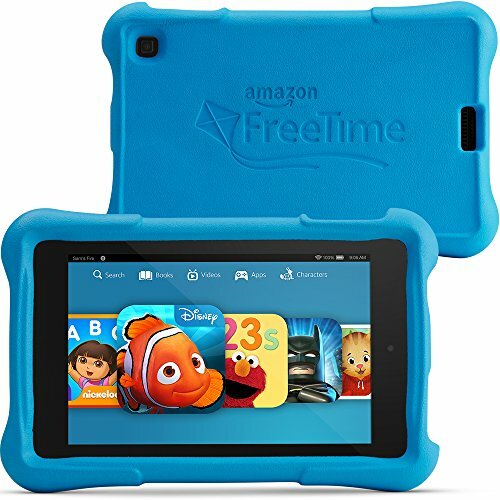 2015-08-17T16:18:23+00:00	By Ken|Tablet Reviews|Comments Off on Amazon Kindle Fire HD 6 Kids Edition Review – Is it the best budget Kids Tablet for 2014?